We have all been there before, the newbies of the IM world. There is so much information available today for the new marketer, but it seems that the fundamental prophecy written by the gods of affosphere has been lost in translation and newbies are just being ‘pwned’ left, right and centre – killing their motivation to succeed. And what is this prophecy? 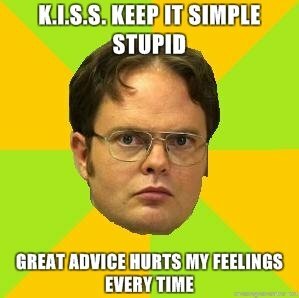 Now before I explain what it is, grab a marker and write this on your forehead – “Keep it Simple Stuipid”. Now every night before you got to bed and in the morning it is subconsiouslly embedded in your mind. I can not tell you the amount of times someone has come to me, lacking motivation because their landing page suited to black women with pink hair, who are single moms and want love in Alaska was not working for them…. Or they jump into PPV and spend days on end trickling in 100 views a day because their targeting is so tight and they kill their dreams from 27 cent losses. If you wanna make some money you have to K-I-S-S! The first step for the new marketer I would say is jump on social traffic, particularly Facebook and Plenty of Fish. Forget making custom landing pages, and go into your network and you will see 100’s of offers dedicated to niches, pre-tested by the advertiser to convert! And you know what? They do convert and they convert well. So if you are struggling still to make a profit online, even your first $100/day take a step back and leave those ultra mega guru tips to the professionals and build your base with the easier platforms. I hope this helps somewhat and if anyone needs some more help on what I’m trying to convey here, drop a comment, drop an email and myself or Andrew will get back to you and help your poor newbie soul can get on the right track! If you’re like me, you probably have spent hours uploading ads to Facebook only to have them immediately rejected by one of their incompetent approval staff too lazy to actually check the page your promoting. I was so fed up with the disapprovals, I decided to track the team down for some sweet revenge. 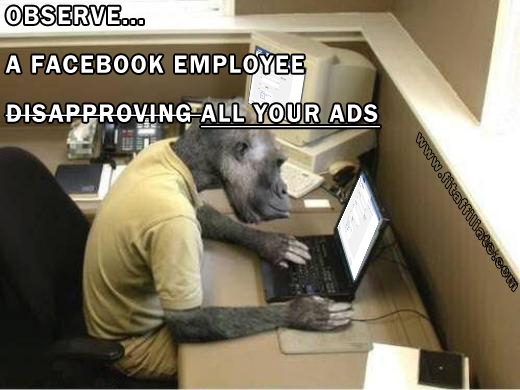 To my surprise, with all the revenue that facebook generates, it seems that they are cutting corners and hiring monkeys. This is what I found! 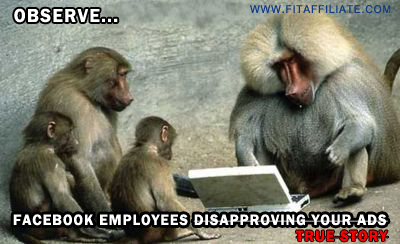 Post your hate below, or even better, your “True Story” Facebook Employee Photos.. (who are of-course, from the above evidence, closely related to us humans, but not quite there yet).